I, Shannon Huffman the owner of Sauk LLC along with my family have a combined total of over 40 years of expertise in the dog world. My last 10 years have been dedicated to the GSD. Placing German Shepherds and other working breeds with countless individuals, families, law enforcement agencies, world level sport competitors, search & rescue partners, as service dogs, and in military homes. 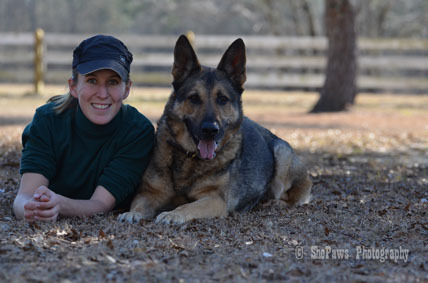 Training and Boarding (all breeds), along with Breeding European GSDs is my full time job, and has been since 2004! We are one of the very few families that dedicates our time and efforts to promoting this breed on all levels. We provide the puppies with a safe growing environment including an abundance of other critters to interact! Winning Regionally and Nationally in the show ring, competing on the working field regionally, and nationally we have a lot of experience in what it takes to know the tools required for homes of all venues. After a lot of time and consideration, in January 2014 we have began putting our focus to training for outside clients as well! We offer boarding and training for dogs of all breeds and as a great foundational tool for those who wish their puppies to grow up with the VDS advantage. Handling a variety of young dogs, and adults in training keeps us fresh in understanding of what the general family would like from their dog. Behavioral expertise and understanding of all breeds gives us the tools to help you train whatever breed you own if you choose to use us as trainer. Anyone involved in the breed must promise to keep the standards to the utmost height. This means simply no back yard puppy farming, but true researched, educated breeding decisions only. This is only done by PERSONALLY maintaining current involvement in ALL sides of the breed. Understanding the price tags involved to do this as well. Our dogs are priced based on what it costs us to do what we do. We are constantly staying informed and educated in health, pedigrees, and training. Many breeders do not personally do this. You must actively part take in hands on involvement to do this properly! Claiming champion lines doesn't mean you breed quality. Our current up to date success not to forget our prior success in the international show ring and working dog competitions (Schutzhund, IPO with Background in SAR) ensure we regularly maintain the best personal relationships with those involved in the sport and show. We stay current on health, training standards and behavioral management. This allows us to have some of the strongest dogs in our kennels regarding temperament, health, and train-ability. It also allows us to give you the best advice which is kept current. Our breeding dogs are our FAMILY dogs as well! They are not full time kennel dogs dusted off and bred at our pleasure. If they can't part take in our home life, they are in a co-owned home to provide a full time family! Maintaining international and national connections keeps our tool box full and gives us the ability to help place pups and dogs in homes as the best family protector, loving companion, friend, and working dog. As a trainer and one of America's best, we focus on rehabilitating and doing family training for the best of the best and the worst of the worst. Including all breeds! We believe if you breed you should also rescue and we do. In the past years we've placed litters as well as adult Labrador Retrievers, German Shepherds, Huskies, and pure mixes into family homes. We've also provided rehabilitation training for aggressive or overly submissive dogs bringing a renewed mental stability to their owners and a new leash on life for the dogs. Part taking in training across the world has given us the tools to bring this knowledge home to America! Our goal with every dog sold, or any training we provide is to promise commitment in our relationship to offer our knowledge with life long support. This includes dietary coaching, healthy canine lifestyle choices regarding vaccinations and medication, as well as offering training advice whenever it's needed for any dog purchased from us, or any dog that resides with us in training. We believe that by purchasing from reputable people you also purchase knowledge. Don't re-invent the wheel ask when you have questions about your VDS dog. Our past training clinics have brought people into the country from as far away as India. Several people travel a full days drive to get to us for training and coaching because of the extensive background, fun, easy and friendly environment provided year round! I, Shannon Huffman am a member club of UScA, in 2015 I resigned from my position of President and Training Director for Midlands IPO Club (now Black River IPO). Our dogs are registered through the FCI recognized breed registry for the German Shepherd Dog the AKC. Our kennel has passed every on-site inspection required by the registry and the county. All of our sires are DNA tested as well as any dog that is imported. We are also members of them mother country for our breed the SV (Germany) and are members of the DVG. With pleasure I will provide and oversee your desires. With the help of my family, and the expertise of the trainers around me, we will personally select and oversee you achieve the best from your forever friend. Whether you have a German Shepherd from VDS or a dog from somewhere else or of another breed.